inscribed on canvas verso: ‘To Jules from (? )’ Provenance: The Richard Berry Collection, Melbourne. Comments: An artist whose name is given as J. S. Bowman exhibited at the Victorian Academy of Arts in 1876. In the same year a Zenobia Bowman exhibited pastels. One of her works was exhibited in ‘Australian Art in the 1870s’ at the Art Gallery of NSW in 1976, curated by Daniel Thomas. Zenobia was denoted as “Miss Zenobia Bowman, amateur, Victoria”. 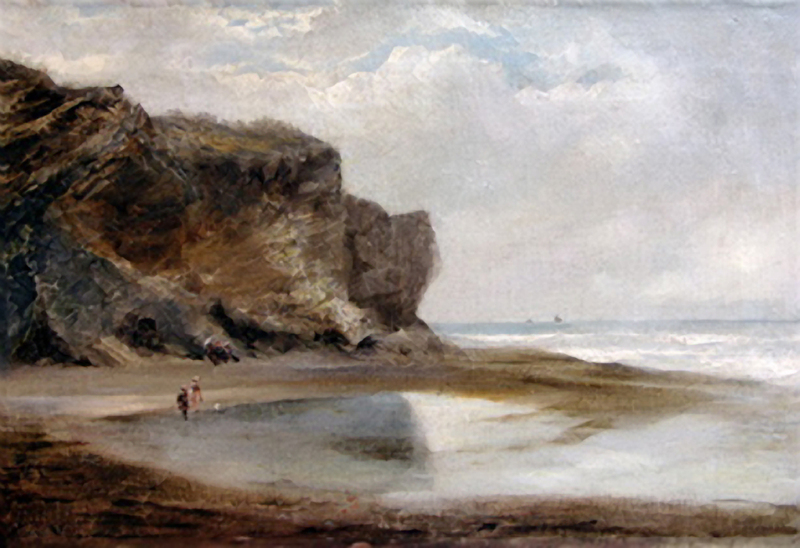 Other titles exhibited by Zenobia are “Coast near Loutit Bay, Gippsland” (these are likely to be two paintings), “Near Melbourne”, “Mount Greenock” and “Sketch on the Genelg” as well as some Australian Alps and Tasmanian scenes. Thomas states that John S Bowman appears in the “Melbourne Trade and Professional Directory in 1872.”. Thomas says perhaps John is Zenobia’s father. Joan Kerr in Heritage states that J. S. Bowman (1819 – c1912) was Zenobia’s father and teacher. She gives J. S. Bowman’s full name as John Shearer Bowman and has him arriving in Victoria from Scotland in 1853, presumably to look for gold. She says that ‘from about 1872 Bowman had a studio and art school in Russell Street, Melbourne’. A major painting “Pioneers Mount Kosciusko” by JS Bowman appeared on the market in 2001 and the catalogue stated “Born in England in 1820, John Shearer Bowman arrived in Australia in 1857 and settled in Victoria. A competent painter of Australian highland landscapes, he travelled throughout Tasmania, Gippsland, the Victorian Alpine region and the Snowy Mountains recording dramatic panoramas in both oil and pastel. Records in the Victorian State Library indicate that he was involved in the foundation of the Victorian Academy of Arts in 1870, although an unresolved dispute appears to have prevented him from exhibiting with the society or being credited as a foundation member. He exhibited several works in the 1876 New South Wales Academy of Art Exhibition, one of which, a portrait of Charles Dickens, remains in the collection of the State Library of New South Wales. He also continued to exhibit regularly in London, submitting 10 paintings to the London International Exhibition of 1872, and again in 1873, as recorded by the London Art Journal of that year” There are 7 paintings by John S Bowman which are listed on Australian Art Sales Index, but none by TS or Zenobia. Most had been in the family which would help explain why so few are offered for sale. However, there are two works sold in the UK by Thomas S Bowman. These appear to be Scottish scenes as they are titled “Highland Landscape” and Mountain Stream” and both are dated 1895. There are other works exhibited in !921-26.